and a selection of teas. like a meringue and was yummy! Our selections were served uniquely plated. cups. The loose tea had been brewed in t-sacs. The server refilled our pots with hot water at least twice each. That's a lot of tea! You can see 8-year-old AJ enjoying one of his pastries above! 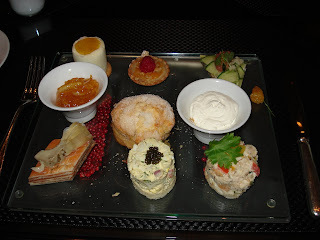 The Four Seasons certainly does a good job with presentation - the food looks delicious. 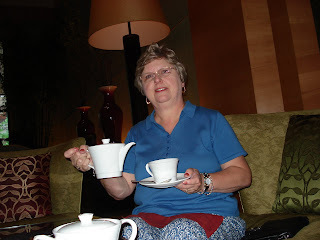 I've really been enjoying your posts on all the wonderful spots that you've taken tea. Everything looks yummy and you look like you're enjoying yourself! 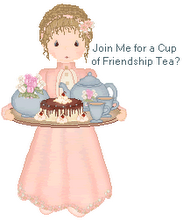 Your afternoon tea looks so wonderful Linda, nice photos. Oh my, but that looks good. Loving your new look on the blog. I love that your guys are so well-educated in all things tea and quite comfortable in tearooms! Thanks, Angela. 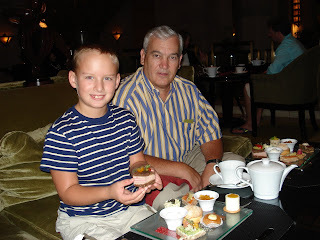 AJ has been going to afternoon tea since he was 11 months old. GJ got hooked on afternoon tea in England in 1998.